It’s just what happens with knitting in the round. 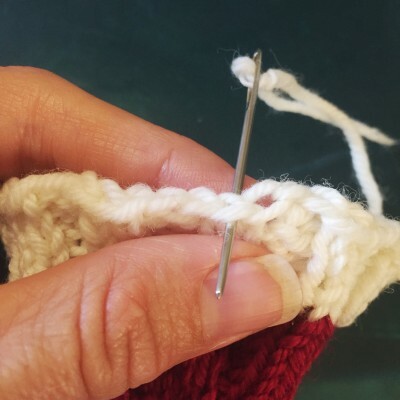 You get a gap or a jog where the first stitch of your cast on edge seems to hang off independently. This is pretty unsightly. It makes you feel like your knitting isn’t as professional as other people’s. But it’s not you, it’s the knitting. You’re not building a brick wall with each layer stacked perfectly on the last. 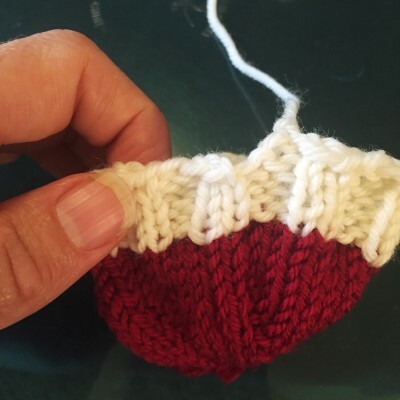 With knitting in the round, you’re building a spiral, with each successive row moving up and over the last row, like building a coil pot in the clay unit of art class. This is what you get (flipped upside-down to sew in the end). What you want to do is grab the chance presented to you by the end you need to weave in. It is a golden opportunity to smooth that join, to bridge the gap between the beginning of the spiral and where it starts to climb. STEP 1: Find the first, clear V that is waiting on the other side of the gap. Insert the needle under both legs of that V. See what I’m doing in the above photo. STEP 2: Now look on top and find the V that is on the right side of the gap. Thread the needle under both legs. 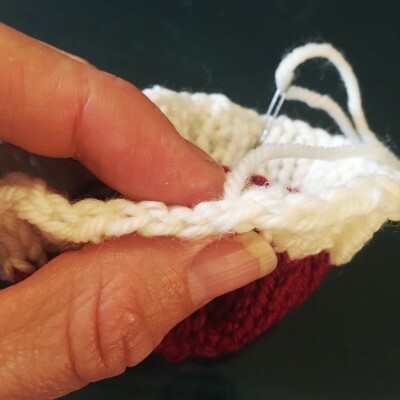 Gently draw the yarn through. Don’t pull it too snug. 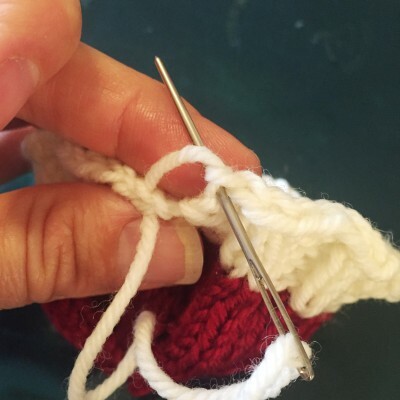 You are creating a V that will bridge between the two stitches, so leave enough slack that you are making a V about the same size as those around it. STEP 3 & 4: Now repeat those two steps again. 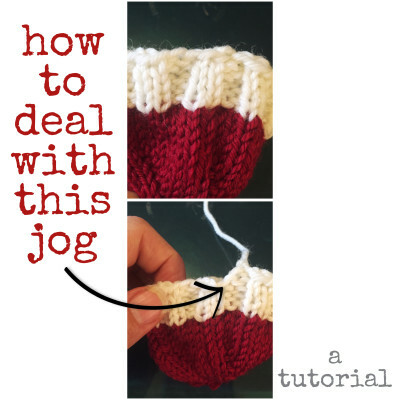 This isn’t always necessary, depending on the plumpness of the yarn and the way your knitting is working up. I often find, though, that looping through one extra time really fills in the space and makes the join fade away into invisibility. TA DA! From the edge-on view you will have a tidy set of Vs marching around. There are at least two ways to work the first round WITHOUT leaving the gap, so you don’t have to do any compensating when weaving in the end. 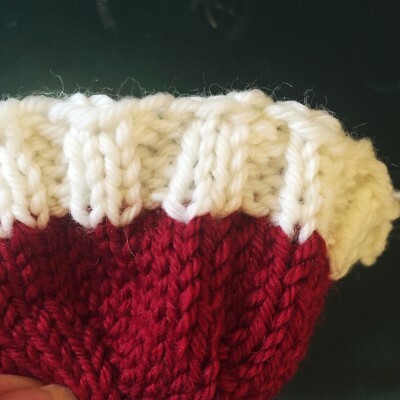 The first is to add one stitch to the cast-on number, then knit the first stitch and slip the last cast-on stitch over it, which removes the extra stitch and the gap. 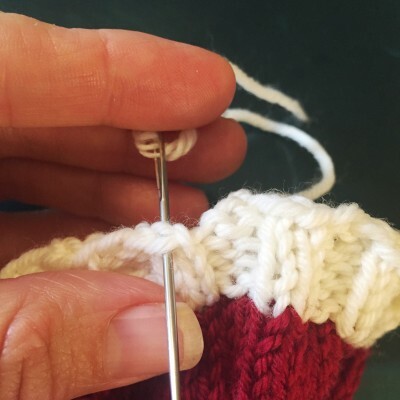 The second is to knit the first stitch, then slip the last cast-on stitch to the left needle and knit it; this method doesn’t require the extra cast-on stitch.